Active commuting increases levels of physical activity and is more likely to be adopted and sustained than exercise programmes. Despite the potential health, environmental, social and economic benefits, cycling and walking are increasingly marginal modes of transport in many countries. This paper investigated regional and individual differences in cycling and walking to work in New Zealand over the 15-year period (1991-2006). New Zealand Census data (collected every five years) were accessed to analyse self-reported information on the "main means of travel to work" from individuals aged 15 years and over who are usually resident and employed in New Zealand. This analysis investigated differences in patterns of active commuting to work stratified by region, age, gender and personal income. In 2006, over four-fifths of New Zealanders used a private vehicle, one in fourteen walked and one in forty cycled to work. Increased car use from 1991 to 2006 occurred at the expense of active means of travel as trends in public transport use remained unchanged during that period. Of the 16 regions defined at meshblock and area unit level, Auckland had the lowest prevalence of cycling and walking. In contrast to other regions, walking to work increased in Wellington and Nelson, two regions which have made substantial investments in local infrastructure to promote active transport. Nationally, cycling prevalence declined with age whereas a U-shaped trend was observed for walking. The numbers of younger people cycling to work and older people walking to work declined substantially from 1991 to 2006. Higher proportions of men compared with women cycled to work. The opposite was true for walking with an increasing trend observed in women aged under 30 years. Walking to work was less prevalent among people with higher income. We observed a steady decline in cycling and walking to work from 1991 to 2006, with two regional exceptions. This together with the important differences in travel patterns by age, gender and personal income highlights opportunities to target and modify transport policies in order to promote active commuting. Physical activity provides substantial health benefits such as avoiding premature deaths , lowering the risk of a range of health conditions, notably cardiovascular diseases  and some forms of cancer , and enhancing emotional health . While regular physical activity (i.e., undertaking at least 30 minutes of moderate intensity physical activity on most, if not all, days of the week) is recommended to promote and maintain health [5–7], maintenance of such activity has been identified as a major barrier for health behaviour interventions [8, 9]. Previous research suggests that active commuting (building cycling and walking into daily life) may be more likely to be adopted and sustained compared with exercise programmes . We have found published evidence of a variety of health benefits associated with active commuting. For example, obesity rates are lower in countries where active travel is more common . A recent review reported that active commuting was associated with an 11% reduction in cardiovascular event rates . A Copenhagen study found a 28% lower risk of mortality among those who cycled to work, even after adjusting for leisure time physical activity . Similar associations were observed among Chinese women who cycled or walked for transportation . In addition, active commuting may enhance social cohesion, community livability and transport equity [15–17], improve safety to all road users , save fuel and reduce motor vehicle emissions. A previous study predicted that if recommended daily exercise was swapped for transportation, this could reduce 38% of US oil consumption (for walking and cycling) and 11.9% of US's 1990 net emissions (for cycling), and could burn 12.2 kg of fat per person annually (for walking) and 26.0 kg of fat per person annually (for cycling) . These effects are important not only in high-income countries in which the private motor vehicle has long been the dominant mode of transport but also in rapidly industrialising parts of the world, such as China, in which active commuting was until recently very common, but is now being replaced by motorised transport . New Zealand is among the countries with the highest rate of car ownership in the world (607 cars per 1000 population) . Driver or passenger trips account for four-fifths of the overall travel modal share  although one third of vehicle trips are less than two kilometres and two-thirds are less than six kilometres . While the national Transport Strategy aims to "increase walking and cycling and other active modes to 30% of total trips in urban areas by 2040" , this target is unlikely to be met given current patterns of expenditure on the transport network . Travel to work makes up about 15% of all travel in New Zealand . Use of private motor vehicles is the dominant mode of travel to work  and may be sensitive to changing oil price . The aim of this study was to investigate regional and individual differences in cycling and walking to work in the employed Census population over the 15-year period between 1991 and 2006. Possible intervention and policy options to promote active commuting will be discussed from New Zealand and international perspectives. This paper presents an analysis of aggregate data obtained from the New Zealand Census undertaken by Statistics New Zealand every five years. Each Census since 1976 has collected information about the "main means of travel to work". However, the question was not date-specific prior to 1991. The last four Censuses (1991, 1996, 2001 and 2006) asked usually resident employed persons aged 15 years and over about their main mode of transport to work on the date of Census (first Tuesday in March). For example, the 2006 Census asked the question "On Tuesday 7 March what was the one main way you travelled to work - that is, the one you used for the greatest distance?" and response options included: worked at home; did not go to work; public bus; train; drove a private car, truck or van; drove a company car, truck or van; passenger in a car, truck, van or company bus; motorbike; bicycle; walked or jogged; and other. The non-response rates to this particular question were 1.6%, 3.3%, 3.5% and 3.7% for the 1991, 1996, 2001 and 2006 Census respectively. The sample for this study was restricted to those who travelled to work on the specified day (i.e., those who reported "worked at home" or "did not go to work" were excluded, which ranged from 18% in 1991 to 22% in 2001). The 'means of travel to work' responses were categorised into four main groups: "bicycle", "walk", "public transport" (including "public bus" and "train" responses) and "vehicle driver/passenger" (including "drove a private car, truck or van", "drove a company car, truck or van" and "passenger in a car, truck, van or company bus" responses). Trends in the main means of travel to work were presented for the 30-year period (1976 to 2006). As the data collected prior to 1991 were not date specific, the 1991 and 2006 Census data were used to examine trends in cycling and walking to work by region, age and gender. There are a total of 16 regions in New Zealand defined at meshblock and area unit levels: nine in the North Island and seven in the South Island. A meshblock is the smallest geographic area containing an average of 100 people and 40 dwellings . Total personal income before tax in the 12 months ending 31 March was collected as a range and the data were analysed for the 2006 Census only due to limited comparability of data across Censuses. All data were self-reported and only aggregate data were available for this analysis. The Ministry of Transport's Household Travel Survey data (2003-2008)  were used to compute the average distance of home to work trips in each region. It is a national survey collecting data on personal travel from about 3500 people (from about 2000 households) throughout New Zealand each year. The data were weighted to account for household and person non-responses. Information on other regional characteristics was obtained from the Statistics New Zealand (population density)  and the National Institute of Water & Atmospheric Research (climate status) . The relationship between these characteristics and participation levels of active transport were measured using Spearman's rank correlation coefficient and linear and non-linear regression. The majority of people travelled to work by car, with an increasing trend over time from 64.8% in 1976 to 83.0% in 2006 (Figure 1). In contrast, walking to work declined over this 30 year period (12.8% in 1976 to 7.0% in 2006). The prevalence of cycling to work increased slightly from 1976 (3.4%) to 1986 (5.6%) and then declined steadily. In 2006, only 2.5% of people who travelled to work used a bicycle. The prevalence of public transport use decreased from 12.8% in 1976 to 5.1% in 1991 but remained stable at around 5.0% over the last 15 year period. Mode of travel to work on the census day in the usually resident employed population aged 15 years and over (1976 to 2006). 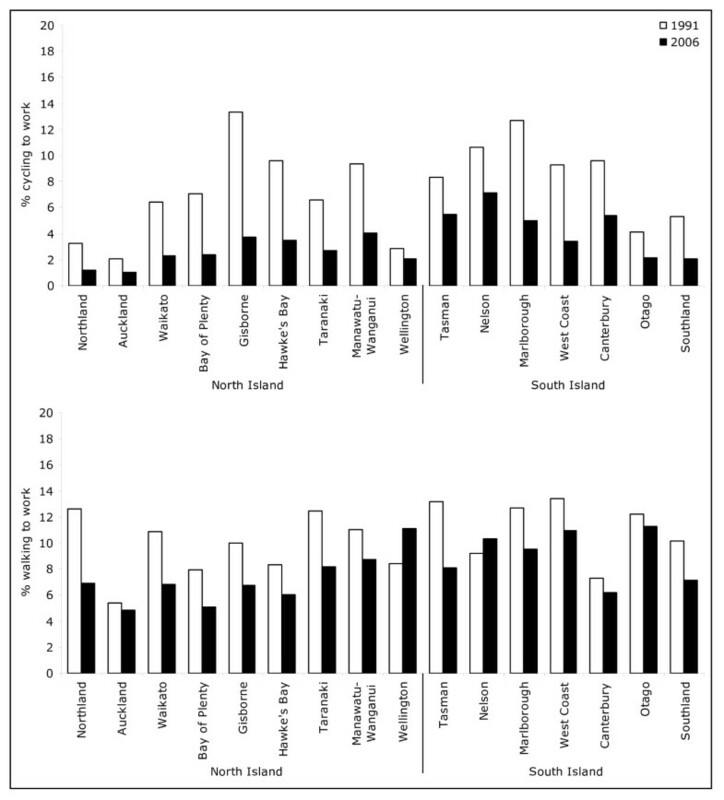 Regional variation in active transport along with environmental and geographic factors thought to influence this variation is presented in Table 1. Auckland is the most populated region and West Coast, the least. The average distance of the trip to work varies from 6.7 km in West Coast to 14.8 km in Waikato. There is a moderate variation in average temperatures and sunshine hours with highest levels recorded in regions in the north of the South Island; and a three-fold variation in rainfall across the major urban areas of different regions around the time of the census. Active travel to work varied widely across regions. In 2006, Nelson had the highest prevalence of cycling (7.2%) and Auckland, the lowest (1.0%) (Figure 2). All regions experienced a sharp fall in cycling prevalence, most steeply in Gisborne, over the 15 year period between 1991 and 2006. 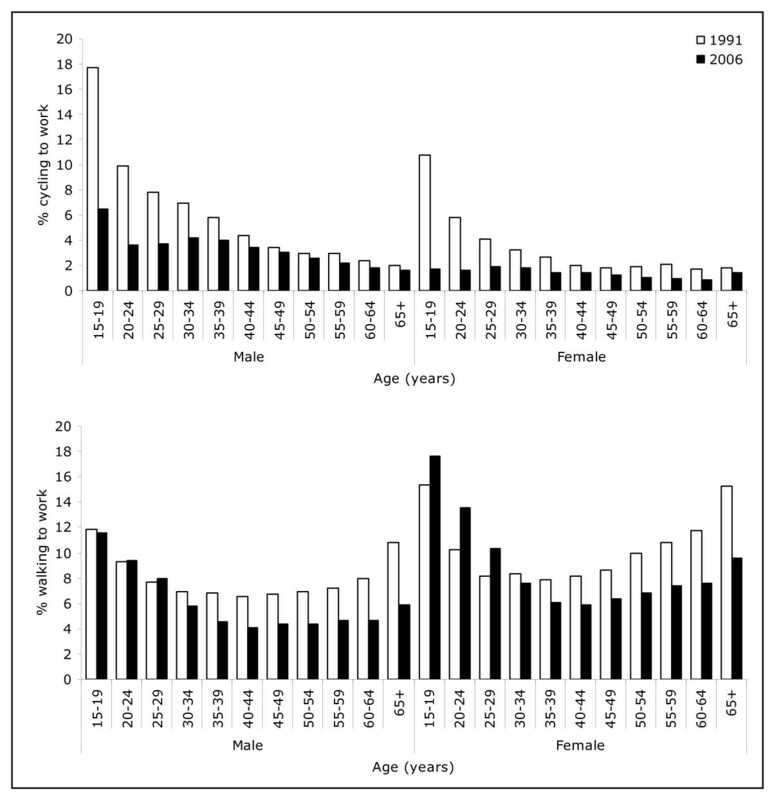 Walking prevalence was highest in Otago (11.3%), Wellington (11.1%) and West Coast (10.9%) and lowest in Auckland (4.9%). Contrary to other regional trends, the proportion of people who walked to work in Wellington and Nelson increased from 1991 to 2006. Proportion of people who cycled and walked to work on the census day by area of usual residence (1991 to 2006). 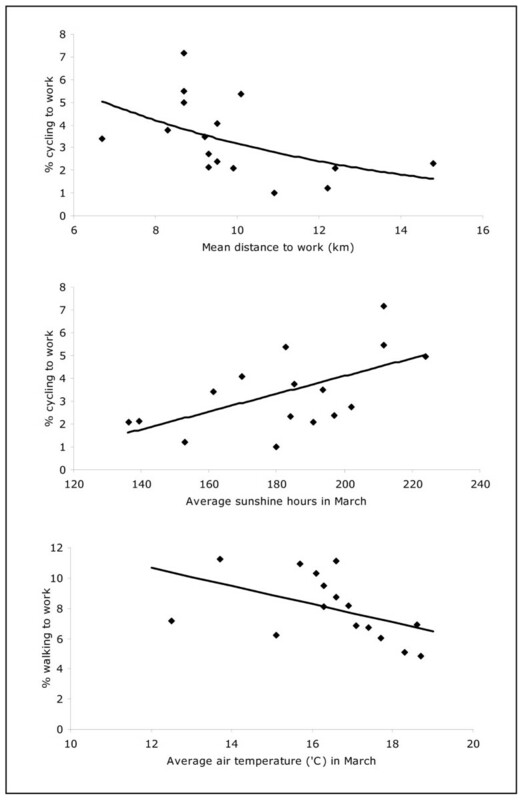 The prevalence of cycling to work was negatively correlated with the average distance of home to work trips and positively correlated with average sunshine hours whereas the prevalence of walking was negatively correlated with average air temperature (p < 0.05) (Table 1). Further explorations revealed the relationship between cycling prevalence and average distance to work to be log-linear and the relationships between cycling prevalence and average sunshine hours as well as walking prevalence and average temperature to be linear (Figure 3). Relationship between the prevalence of cycling and walking to work and specific regional factors. Higher proportions of men compared with women cycled, while higher proportions of women walked to work (Figure 4). In 1991, the prevalence of cycling to work declined with age but this trend was less pronounced in 2006. The largest decline in cycling over the 15 year period was among younger age groups, particularly 15-19 year olds. Walking to work was least prevalent among middle-aged men and women. A significantly higher proportion of 15-29 year old women walked to work in 2006, compared with 1991. The prevalence of cycling to work did not vary significantly by personal income level whereas walking to work was less prevalent among people with higher income in 2006 (Figure 5). Proportion of people who cycled and walked to work on the census day by age and gender (1991 to 2006). Proportion of people who cycled and walked to work on the census day by personal income (2006). Our analysis showed that more than four-fifths of New Zealanders used a private motor vehicle to travel to work on Census day in 2006. Only one in fourteen people walked to work and one in forty cycled. 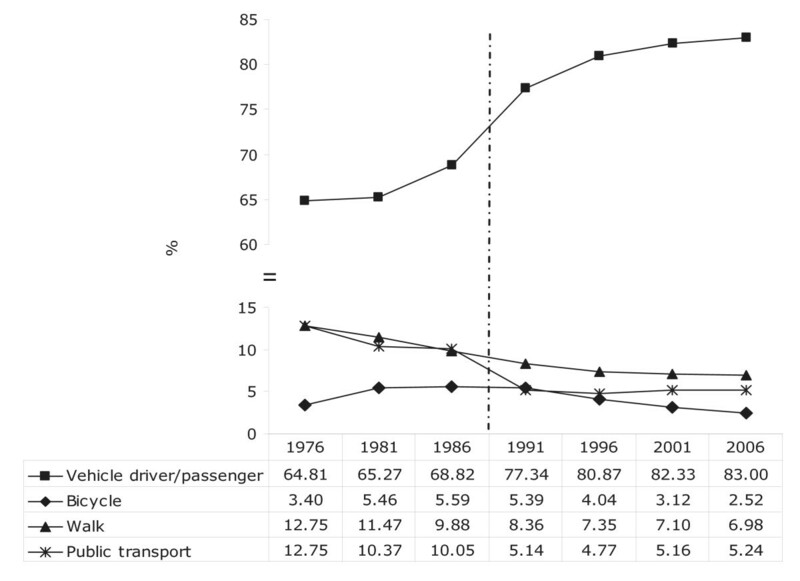 Increased car use from 1991 to 2006 occurred at the expense of active means of travel as the prevalence of using public transport remained unchanged during that period. We found important differences in active travel patterns by region, age, gender and personal income. 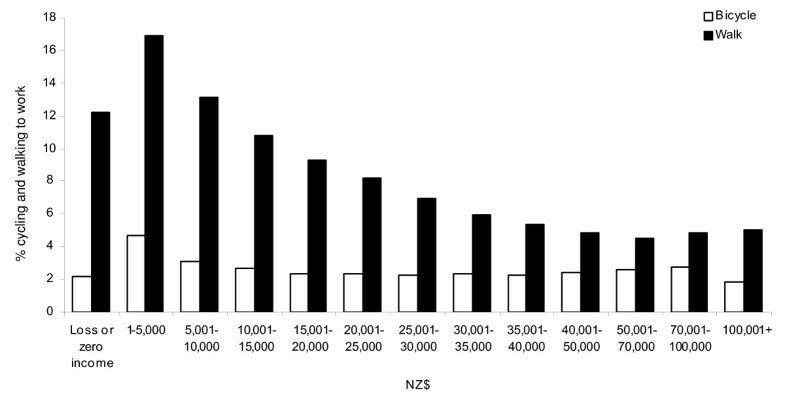 This is one of very few papers reporting population-based active travel behaviour in New Zealand. One of the major benefits of using Census data is that it is a near-complete survey of the general population (96.3% response rate in 2006) and the people's transport activity nationally, regionally and across different population subgroups over time may be compared. When interpreting these results, however, some limitations need to be considered. First, the Census question asked only for 'main means of travel to work' and did not take into account multiple transport modes, for example, walking and taking a bus in one journey. This means the contribution of walking to the journey to work may be under-estimated. Second, the 1991-2006 Census questions were date-specific and the data may be biased seasonally, although the timing of Census day has been similar year to year. People's active transport activity may be overestimated in this case as the Census is usually in March when the weather is warm and relatively dry. Third, we were not able to adjust for potential confounders as only aggregate data were available for this analysis. For example, personal income may be related to an individual's age, gender and residential area, all of which independently, influence choice of travel to work. Finally, the findings may be affected by the "ecological fallacy" as averaged aggregate data were used to infer relationships, for example, between various regional characteristics (such as average distance to work) and the proportion of cycling and walking to work. These questions may be addressed in future studies which obtain individual level data. Despite these limitations, our findings are consistent with and extend the evidence gained from previous research. Parallel to decreasing trends in active travel to work behaviour, overall travel mode share for cycling and walking has been declining steadily in New Zealand (from 4% and 21% respectively in 1989 to 1% and 16% respectively in 2006) . During the same period, the annual distance driven in light 4-wheeled vehicles has been increasing - particularly among the 45-64 age group . From 1990 to 2006, total greenhouse gas emissions increased by 25.7%, and emissions from road transport increased disproportionately (by 66.9%) . In 2006, transport accounted for 42% of total emissions from the energy sector . A recent report indicates that the air quality in Auckland is worsening due to emissions from increasing use of motor vehicles . A study from the US shows that CO2 emissions from the transport sector will continue to rise unless vehicle kilometres travelled can be substantially reduced, as present trends in car use will overwhelm the gains that may result from technological advances such as changes in fuel type (e.g., biodiesel fuel) and motor vehicle efficiency (e.g., hybrid cars) . The findings are unlikely to be different in the New Zealand context given the country's dispersed population (4.3 million people spread over 268,680 km2), low density cities and automobile centred transportation system. Other studies have found that New Zealanders rarely cycle or walk even when travelling short distances. Walking represents only 39% of all trips under two kilometres and cycling accounts for three percent of all trips under two kilometres and two percent of all trips between two and five kilometres in the 2004-2007 household travel surveys . Only one-fifth of New Zealanders surveyed in 2003 strongly endorsed plans to replace car trips with active modes such as cycling and walking on at least two days per week and less than half of the latter considered cycling for short distances [39, 40]. Although a variety of factors can influence public attitudes and behaviour , these findings are likely to reflect decades of under-investment in public transport and cycling and walking infrastructure. In Auckland, the construction of motorways has been favoured consistently over alternative modes in transport planning over the past 50 years . We observed regional differences in patterns of cycling and walking to work. Such differences may be partly explained by aspects of the physical environment such as weather, climate and topography (hilliness) [43–45] and distance to work . The influence of environmental factors such as average temperatures and rainfall, however, should not be over-emphasized. A number of cities in North America and Europe have reported substantial increases in the prevalence of walking and cycling in the last decade, for example, daily ridership doubled in New York between 2001 and 2006 , yet have climates much less favourable than those of most parts of New Zealand. We found low rates of cycling to work in regions with long average distances to work (≥ 10 km). Statistics New Zealand reported that on the Census day in 2006, 83% of people who walked to work travelled less than 5 km and 89% of those who cycled to work travelled less than 10 km . Although distance to work is not easily changed, increased housing density, availability of public transport and investment in active transport infrastructure such as bicycle lanes and shared paths may improve engagement in active travel modes. Two New Zealand regions that bucked the overall trends by revealing increasing levels of walking warrant further comment. Regional strategies in Wellington and Nelson have made substantial investments in active transport. Wellington has proposed an urban development strategy , based on the idea of a "growth spine" (a strip of land along which more intensive urban development is encouraged), a bus lane programme  and school, workplace and community travel plans . In Nelson, pedestrian, cycling and urban growth strategies have been implemented with integration between transport planning and urban development teams . Future research will be required to investigate the effectiveness of these and other active transport strategies being implemented. Studies from other automobile dependent countries such as the US, UK and Australia have also reported a comparatively low level of cycling and walking to work [52–56], with important sociodemographic variations in the patterns of active travel. In general, men are more likely to cycle than women; and women are more likely to walk than men. Younger people are more likely to walk and cycle compared with older age groups. This is important because it will be necessary to boost walking and cycling rates in the older age groups to realise the potential health benefits of active transport. The cardio-protective effects of exercise relate much more closely to current activity than to past exposures . Our study shows that walking is more common in lower income groups, whereas socioeconomic status does not appear to influence cycling. Similar patterns were observed in previous research [53, 58, 59]; however, others reported associations between cycling and income [44, 60]. In contrast, in most European countries, walking and cycling make up at least one-fourth of all urban trips (45% in the Netherlands) and active travel patterns are universal across different segments of society; walking increases with age, cycling declines only slightly, women cycle as much as men, and people from all income classes cycle [11, 58, 61–64]. The success of European countries in promoting cycling and walking is attributed to the "coordinated implementation of the multi-faceted, mutually reinforcing set of policies" in the past few decades [58, 61]. Components include: provision of better facilities for pedestrians and cyclists, extensive traffic calming of residential neighbourhoods, increased traffic regulation and enforcement, people oriented urban design, integration with public transport, comprehensive traffic education and training, restrictions on car ownership, use and parking [58, 61] and workplace travel plans . In countries like New Zealand, significant barriers exist to implementing such comprehensive measures to promote active commuting but much could be achieved in the short term. For example, although Australia has sprawling cities and a high rate of car ownership, the prevalence of cycling to work has increased substantially in some states in the last decade together with growing investments in bicycle infrastructure (for example, there was a 43% increase from 2001 to 2006 in cycle commuters in Melbourne) [66–68]. Likewise, we found an increasing trend of walking to work in the two New Zealand regions that have invested in sustainable transport strategies. As an important initial step at the national level, a project has begun to build a cycleway network running the length of New Zealand . While primarily intended to enhance tourism, the initiative has the potential to promote active commuting if a comprehensive cycle network plan is incorporated to strengthen connections between residential areas and key activity centres in urban and rural New Zealand. A potential way to move toward more attractive environments for active commuting without major infrastructural change is reducing the speed limit in residential streets, which currently is 50 km/hr in New Zealand compared with 30 km/hr (or less) in European countries . Given a favourable trend in cycling and walking as a recreational activity in New Zealand , another useful step would be offering interventions promoting a modal shift, i.e., from using cars to walking and cycling, tailored to recreational cyclists and walkers. The effectiveness of such targeted behaviour change programmes has been reported in a previous review . An Australian study showed that participants in mass cycling events, particularly novice riders and first-time participants, cycled more frequently in the month after the event . Walking and cycling are increasingly marginal modes of travel to work in New Zealand and socio-demographic differences exist in such behaviour patterns. Increased walking to work, recorded in some regions, indicates that potential gains may be made with systematic promotion of active modes. Translating such successes to the national level requires political will and public support to redress decades of land use and transport policies that have prioritised car use. The rising cost of fuel linked with a resurgence in recreational cycling and walking may provide the impetus to seriously promote cycling and walking as safe and attractive choices for travel to work. We thank Mr Wayne Gough at the Statistics New Zealand for providing Census data on travel to work behaviour, Ms Lynley Povey at the Ministry of Transport for providing Household Travel Survey data, and Dr Andrew Tait and Ms Georgina Griffiths at the National Institute of Water &Atmospheric Research for providing climate data. STT has contributed to acquisition, analysis and interpretation of data and drafting the manuscript. AW, ST and SA have contributed to interpretation of data and revising the manuscript critically. All authors have given final approval of the version to be published.